It’s the chrysalis of a black swallowtail (Papilio polyxenes asterias). My favourite thing: the delicate line of silk holding the chrysalis in place, at just the right angle. Incredible. 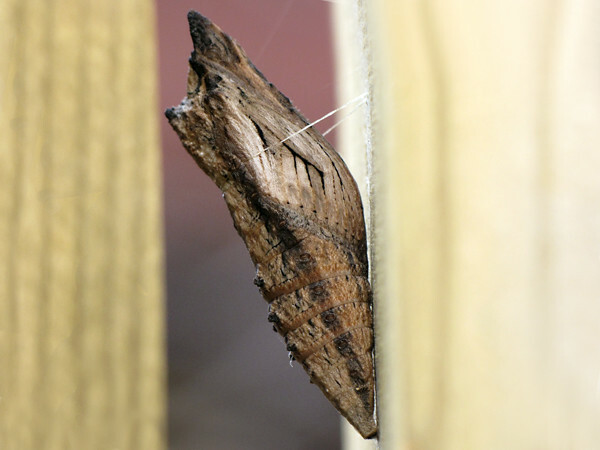 We do see the adult butterflies often in our yard, but I don’t think we’ve ever come across the pupa before. I’m excited that it’s in a well-protected but accessible space, and dearly hope to witness its emergence in the spring. Fingers crossed!